Enacted on December 22, 2017, the Tax Cuts and Jobs Act (TCJA) was hailed as the largest major tax reform for the past three decades. In particular, the TCJA contains a series of favorable accounting method reforms that will impact countless of business taxpayers such as the use of cash method of accounting and the exemption from IRC Section 263A – UNICAP, which are effective for taxable years beginning after December 31, 2017. Under the TCJA, the average annual gross receipts test for cash method of accounting is increased from $5 million to $25 million. In most cases, any business taxpayers that meet the $25 million gross receipts test is permitted to use the cash method of accounting, unless it is prohibited from using the cash method of accounting or expressly required to use the accrual method under IRC section 448. As such, this liberalization from $5 million to $25 million expands the use of cash method of accounting for a greater number of taxpayers. For tax purposes, there are definite advantages to the cash method of accounting. It is simple to implement and maintain and does not require the level of internal accounting structure and expertise necessary for businesses that are under the accrual method. Cash method of accounting, in brief, are recording transactions only when they are received or paid. This simplicity can translate to significant manpower savings. The cash method of accounting allows for better matching of cash available for income tax payments with the recognition of corresponding revenue. This ensures that funds are available for tax payments and is particularly beneficial to taxpayers with restricted or uneven cash flows. It frequently defers the recognition of income to a later period, which allows taxpayers to receive the time value of money for deferred tax payments. For example, cash method of accounting would allow you to defer income to next year by delaying invoices or to shift deductions into the current year by accelerating the payment of expenses. Whereas, an accrual-basis does not offer such flexibility. When the income deferral continues year after year, assuming there is no increase in tax rates and the taxpayer remains in business, a portion of the time value of money converts into a permanent benefit. You may have heard of the terms UNICAP or IRC Section 263A, but what does it mean? IRC Section 263A details the uniform capitalization (UNICAP) rules that require the capitalization on certain expenses/period costs as part of the inventory, instead of immediate expensing. In detail, the UNICAP rules require certain direct and indirect costs associated with real or tangible personal property manufactured by a business to be included in either inventory or capitalized into the basis of such property. For real or personal property acquired for resale, the UNICAP rules require certain direct and indirect costs associated with the property to be included in inventory. Before the TCJA, an exception is provided for the reseller with average annual gross receipts of $10 million or less. Under the TCJA, the average annual gross receipts test that exempt business taxpayers from the requirement to capitalize IRC Section 263A costs under the uniform capitalization rules is increased from $10 million to $25 million. On top of which, the exemption expands to include both producers and resellers. In summary, TCJA opens the door to many business taxpayers with the use of cash method of accounting and exemption from complex UNICAP rules. 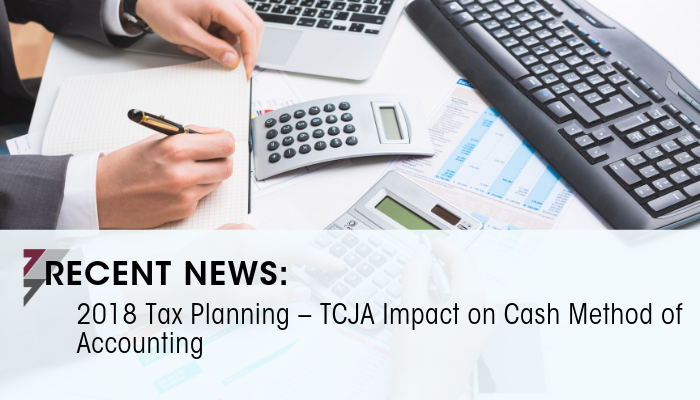 Under TCJA, businesses are highly encouraged to begin planning for 2018 and onward as soon as possible to comply and achieve maximum tax savings under the tax reform. If you have any questions, please contact our tax team.